at risk for the benefit of others. That's the definition of a hero. If you find a Hero Hawk, please post their story. Today, in a San Diego courtroom, both Ernie Casco and Dave Beardslee put themselves in the crosshairs of the Torrey Concessionaire by standing as witnesses to the truth. Testimony in a court of law can be intimidating to anyone - in any case. But when you're testifying against someone who's demonstrated a willingness to retaliate, it's even more intimidating. Both Ernie Casco and Dave Beardslee were willing to do that today, and their presence and testimony ensured that justice was done. We live in a time when more and more people ask the question "What's in it for me? ", and yet both Ernie and Dave took a risk by standing up for justice with no reward other than that they did the right thing. As a club and as a society, we should honor and salute those who are willing to make that choice. Today I salute - and thank - Ernie and Dave for being heroes to me. MGF wrote: Can you point to specific decisions made by the USHPA board which negatively affect hang glider pilots, compared to paraglider pilots? 1. Keeping PG in org. while PDMC is fact. Cure: Drop PG. 2. Unfairly tossing out good HG pilots. Cure: Revoke the tosses. Btw if you want a specific example I will pick just one. Ignoring the Different ridge right of way rules policy for commercial PG tandems than solo flights. Pretty dangerous stuff IMO. When the board decided to remove a good HG pilot for testifying in court. I'd like to add Michael Grisham to the list of Hero Hawks. On July 5th, 2018 Michael posted a true account of recent Dockweiler events to hanggliding.org in open defiance of Jack's 8 year gag order on any mention of certain "unmentionable" people and associations. magentabluesky wrote: RE: I CAN NOT KEEP QUIET ANY LONGER. mgforbes wrote: Maybe it doesn't seem reasonable to freeloaders who want to enjoy the use of the land without paying for the cost of getting access. I don't have a lot of sympathy for them. 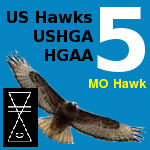 Let me start out by saying, I have been a member of the USHGA/USHPA for over 40 plus years and I support my national personal free flight organization. Although, I must say I do not always agree with the USHPA’s actions or policies. With that being said, here is the story. On June 12, Tuesday, of this year I stopped by Dockweiller Beach for some “wavier only” flying with Joe (USHGA #2), Frank (USHPA#7), and Bob. Wednesday through Sunday Dockweiller is open for flying with Windsports supervising, a USHPA flight school. Joe and Frank arraigned with the county to open Dockweiller on Monday and Tuesday by having the pilot simply sign a liability wavier with the county in compliance with California’s Limited Liability Laws for sporting activities. Now I have a confession to make, I was the freeloader that day. I just showed up with my helmet and harness. Joe, Frank, and Bob brought their gliders, a WW Alpha 210, WW Falcon 195, and a WW Condor 330. I did pay the county beach parking for the day. It was great, as I finally got to fly the Alpha and compare it to the Falcon and Condor. Throughout the day people stopped, watched, and asked questions. And of course “all” of us shared our love and passion for the sport of hang gliding and recommended the interested parties do an internet search for Windsports and/or show up Wednesday through Sunday when a USHPA Instructor would be available. Allowing “wavier only” flying is a win win arraignment for everyone. The county collects parking fees. Windsports gets advertising and promotion on two days of the week that they are closed. Windsports signs up new students for membership with USHPA. This should not be surprising as Joe and Frank are founding members of what became the USHPA. Everybody wins. I should say everyone wins but one – The Unmentionable. Now this is where the story is a little bizarre in this dysfunctional family of personal free flight. 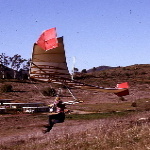 A few weeks earlier, May 27, there was the Otto Lilienthal Meet supervised by Joe Greblo’s Windsports and co-hosted by Frank Colver and the Unmentionable. Frank and the Unmentionable contributed cash out of their pockets to fund the Otto Lilienthal Meet in support of Windsports. There was a table at the meet to sign up 30 day and yearly memberships to USHPA. Anyone just showing up could sign up for lessons by a USHPA Instructor, all legit, paid for by Frank and the Unmentionable. Cash out of their pockets. Now, could the Unmentionable fly? A BIG FAT NO! The Unmentionable is not a USHPA member and Windsports is a USHPA Flight School. He would like to be a member of the USHPA. Obviously membership in the USHPA is voluntary as long as you don’t piss off the upper crust. His actions support the USHPA. The Unmentionable cannot even fly in the meet he is a co-host of, cash out of his pocket. So much for the USHPA’s new policy of inclusiveness. Oh the irony. Now you tell me, Who is Freeloading? Frank Colver wrote: PLEASE REMEMBER EVERYONE THAT THE PERSON EXPELLED FROM THE RRRG (USHPA) WAS EXPELLED FOR PERSONAL HATRED REASONS. HE HAD NOT VIOLATED ANY USHPA SOP'S OR CIVIL LAWS AND HAS A PERFECT FLYING SAFETY RECORD EXTENDING BACK MANY YEARS. IT WAS A PERSONAL VENDETTA AT WORK THERE, NOTHING MORE, NOTHING LESS. EVERYTHING AGAINST HIM THAT HAS BEEN SAID ON THIS FORUM HAS BEEN FROM A PERSONAL HATRED STANDPOINT. NOT ONE SINGLE WORD OF PROOF OF WRONGDOING ON HIS PART. ALL ANYONE COMES UP WITH IS TO LOCK THE TOPIC AND/OR BAN HIS FRIENDS FROM SPEAKING ON HIS BEHALF. I CHALLENGE ANYONE TO PROVE OTHERWISE AND THEN AND ONLY THEN WILL I STAND CORRECTED. IF THIS POSTING GETS ME BANNED, WELL THEN GOOD BYE EVERYONE.